Custom home theater seating featuring Palliser and Row One! We are Dallas' #1 custom home theater seat store! Palliser is the leading name brand in home theater seating. All Palliser theater chairs are made to order for YOU. Choose leather, bonded leather or fabric to cover your media chairs. All the Palliser theater chairs are available in straight or curved configurations in either manual or power recline. 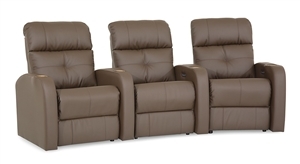 One of our biggest sellers is the Palliser "Equalizer" theater chair! You'll love the look and feel of The Equalizer from the moment you take a seat! As a convenience to our customers, we have chosen to add our biggest selling leathers and bonded leathers to every Palliser theater chair page. The Broadway leather is a durable, thick leather with a heavy grain and is our most popular leather for our customers here in Dallas, TX. For those customers who want to save a little bit of money, we offer the Champion bonded leather option which has a matte finish and a leather-like look and feel. Looking for a specific leather color or fabric option? Email us for a quote!